Here's the fantastically successful strawberries-in-a-basket. 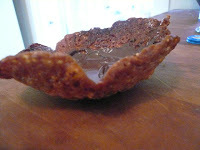 It's an almond lace cookie shell, recipe from The Barefoot Kitchen Witch blog (thanks! ): http://thebarefootkitchenwitch.typepad.com/the_barefoot_kitchen_witc/2008/02/florentines-alm.html. After baking you have to shape the shells while hot into the preferred shape--for me, a bowl. 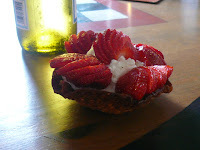 Next I coated the bottom of the "bowl" with dark chocolate, then added whip cream, then the strawberries. It's so simple and sooo yummy. Yippee for great endings to great meals.